Piriformis syndrome (PS) is a painful musculoskeletal condition, characterized by a combination of symptoms including buttock or hip pain. In several articles, piriformis syndrome is defined as a peripheral neuritis of the branches of the sciatic nerve caused by an abnormal condition of the piriformis muscle (PM), such as an injured or irritated muscle. Synonyms that are used frequently for PS are the deep gluteal syndrome, extra-spinal sciatica, wallet neuritis, etc. There are more women diagnosed with Piriformis syndrome than men, with a female–to–male ratio of 6:1. This ratio can be explained by the wider quadriceps femoris muscle angle in the os coxae of women. The piriformis muscle (PM) originates from the pelvic surface of the sacral segments S2-S4 in the regions between and lateral to the anterior sacral foramina, the sacroiliac joint (superior margin of the greater sciatic notch), the anterior sacroiliac ligament and occasionally the anterior surface of the sacro-tuberous ligament. It passes through the greater sciatic notch to insert onto the greater trochanter of the femur. The PM is functionally involved with external rotation, abduction and partial extension of the hip. The sciatic nerve generally exits the pelvis below the belly of the muscle, however many congenital variations may exist. The relationships between the PM and sciatic nerve have been classified by Beaton and Anson using a six category classification system (Beaton and Anson, 1938). An anomalous relationship would be labelled between type ‘‘B’’ through type ‘‘F’’ since type ‘‘A’’ is considered to have a normal relationship between the PM and the sciatic nerve. (E) the sciatic nerve exiting the greater sciatic foramen along the superior surface of the piriformis muscle. The nerve may also divide proximally, where the nerve or a division of the nerve may pass through the belly of the muscle, through its tendons or between the part of a congenitally bifid muscle. According to Boyajian- O’ Neill L.A. et al., who has a level of evidence of 2A, there are two types of piriformis syndrome- primary and secondary. Primary piriformis syndrome has an anatomical cause, with variations such as a split piriformis muscle, split sciatic nerve, or an anomalous sciatic nerve path. Among patients with piriformis syndrome, fewer than 15% of cases have primary causes. At present, there are no accepted values for the prevalence of the anomaly and little evidence to support whether or not the anomaly of the sciatic nerve causes piriformis syndrome or other types of sciatica. These findings suggest that piriformis and sciatic anomalies may not be as important to the pathophysiology of piriformis syndrome as previously thought. Secondary piriformis syndrome occurs as a result of a precipitating cause, including macrotrauma, microtrauma, ischemic mass effect, and local ischemia. Piriformis syndrome is most often (50% of the cases) caused by macrotrauma to the buttocks, leading to inflammation of soft tissue, muscle spasms, or both, with resulting nerve compression. Muscle spasms of the PM are most often caused by direct trauma, post-surgical injury, lumbar and sacroiliac joint pathologies or overuse. PS may also be caused by shortening of the muscles due to the altered biomechanics of the lower limb, low back and pelvic regions . This can result in compression or irritation of the sciatic nerve. When there is a dysfunction of the piriformis muscle, it can cause various signs and symptoms such as pain in the sciatic nerve distribution, including the gluteal area, posterior thigh, posterior leg and lateral aspect of the foot. Microtrauma may result from overuse of the piriformis muscle, such as in long-distance walking or running or by direct compression. An example of this kind of direct compression is known as “wallet neuritis”, which is a repetitive trauma caused by sitting on hard surfaces. Other causative factors are anatomic variations of the divisions of the sciatic nerve, anatomic variations or hypertrophy of piriformis muscle, repetitive trauma, sacro-iliac arthritis and total hip replacement. A Morton's Toe can also predispose the patient to develop piriformis syndrome. A fraction of the population is at high risk, particularly skiers, truck drivers, tennis players and long-distance bikers. Tonley JC had another view about the causes of PS. He mentioned: ”The piriformis muscle may be functioning in an elongated position or subjected to high eccentric loads during functional activities secondary to weak agonist muscles. For example, if the hip excessively adducts and internally rotates during weight-bearing tasks, due to the weakness of the gluteal maximus and/or the gluteus medius, a greater eccentric load may be shifted to the piriformis muscle. Perpetual loading of the piriformis muscle through overlengthening and eccentric demand may result in sciatic nerve compression or irritation”. Patients with piriformis syndrome have many symptoms that typically consist of persistent and radiating low back pain, (chronic) buttock pain, numbness, paraesthesia, difficulty with walking and other functional activities such as pain with sitting, squatting, standing, with bowel movements and dyspareunia in women.. They can also have pressure pain in the buttock on the same side as the piriformis lesion and point tenderness over the sciatic notch in almost all instances. The buttock pain can radiate into the hip, the posterior aspect of the thigh and the proximal portion of the lower leg. Swelling in the legs and disturbances of sexual functions have also been observed in patients with PS. There may be an aggravation of pain with activity, prolonged sitting or walking, squatting, hip adduction and internal rotation and manoeuvers that increase the tension of the piriformis muscle. Depending on the patient, the pain can lessen when lying down, bending the knee or when walking. However, some patients cannot tolerate the pain in any position and can only find relief when they’re walking. Piriformis syndrome is not characterized by neurological deficits typical of a radicular syndrome, such as declined deep tendon reflexes and myotomal weakness. The patient may present with a limp when walking or with their leg in a shortened and externally rotated position while supine. This external rotation while supine can be a positive piriformis sign, also called a splayfoot. It can be the result of a contracted piriformis muscle. Diseases such as appendicitis, pyelitis, hypernephroma, uterine disorders, prostate disorders and malignancies in pelvic viscera. Piriformis syndrome continues to be a controversial diagnosis for sciatic pain. Radiographic studies have limited application to the diagnosis of piriformis syndrome. Although standard anteroposterior radiographs of the pelvis and hips, lateral views of the hips and either CT or MRI of the lumbar spine are recommended to rule out the possibility that the symptoms experienced by the patients originate from the spine or the hip joint. Electrophysiological testing and nerve blocks play important roles when the diagnosis is uncertain. Injection of local anaesthetics, steroids, and botulinum toxin into the piriformis muscle can serve both diagnostic and therapeutic purposes. Patients with piriformis syndrome may also present with gluteal atrophy, as well as shortening of the limb on the affected side.In chronic cases, muscle hypotrophy is present in the affected extremity. The patient reports sensitivity during palpation at the greater sciatic notch, in the region of sacroiliac joint or over the piriformis muscle belly. It is possible to detect the spasm of the PM by careful, deep palpation. With deep digital palpation in the gluteal and retro-trochanteric area, there may be tenderness and pain with an exacerbation of tightness and leg numbness. Pace’s sign consists of pain and weakness by resisted abduction and external rotation of the hip in a sitting position. A positive test occurs in 46.5% of the patients with piriformis syndrome. The patient reports buttock and leg pain during passive a straight leg raise performed by the examiner. Involves pain and weakness on passive forced internal rotation of the hip in the supine position. The pain is thought to be a result of passive stretching of the piriformis muscle and pressure placed on the sciatic nerve at the sacrospinous ligament. Positive in 56,2% of the patients. 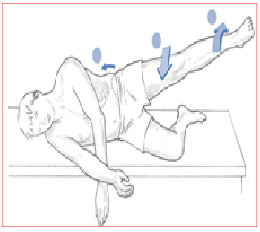 An active test that involves elevation of the flexed leg on the painful side, while the patient is lying on the asymptomatic side. The abduction causes deep buttock pain in patients with PS, but back and leg pain in patients with lumbar disc disease. External isometric rotation of the affected lower extremity following maximal internal rotation may also be positive in PS patients. The patient lies on the side with lower leg flexed to provide support and the upper leg straight, in line with the trunk. The practitioner stands in front of the patient at the level of the feet and observes (no hands-on) as the patient is asked to abduct the leg slowly. Normal – Hip abduction to 45°. Trendelenburg test may also be positive. Conservative treatment for piriformis syndrome includes pharmacological agents [non-steroidal anti-inflammatory agents (NSAIDs), muscle relaxants and neuropathic pain medication], physical therapy, lifestyle modifications and psychotherapy. Injections of local anaesthetics, steroids, and botulinum toxin into the PM muscle can serve both diagnostic and therapeutic purposes. The practitioner should be familiar with variations in the anatomy and the limitations of landmark-based techniques. An ultrasound-guided injection technique has recently been utilized. This technique has been shown to have both diagnostic and therapeutic value in the treatment of PS. Piriformis syndrome often becomes chronic and pharmacological treatment is recommended for a short time period. Surgical interventions should be considered only when nonsurgical treatment has failed and the symptoms are becoming intractable and disabling. Classic indications for surgical treatment include abscess, neoplasms, hematoma, and painful vascular compression of the sciatic nerve caused by gluteal varicosities. Surgical release with tenotomy of the piriformis tendon to relieve the nerve from the pressure of the tense muscle has resulted in immediate pain relief, as reported by several authors. Sometimes, the obturator internus muscle should be considered as a possible cause of sciatic pain. However, the diagnosis of the obturator internus syndrome can only be made by ruling out other possible causes of sciatic pain, which is similar to the manner in which piriformis syndrome is diagnosed. 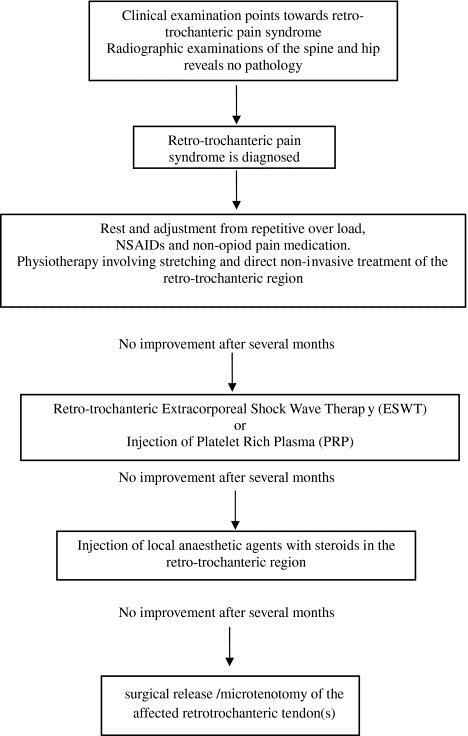 Surgical release of the internal obturator muscle can result in both a short- and long-term reduction in pain in patients with retro-trochanteric pain syndrome and should be considered if conservative treatment fails. Although there is a paucity of recently published controlled trials in which critically examine the effectiveness of the noninvasive management modalities, a number of methods exist for the treatment of ‘Piriformis Syndrome’. The non-invasive treatments include physical therapy, (osteopathic) manipulative treatment  and lifestyle modification. The use of Ozone Therapy can be considered in the management of PS, due to the absence of side effects, the practicality of use and the extent of clinical improvement. To achieve a 60 – 70% improvement, the patient usually follows 2 – 3 treatments weekly for 2-3 months. First of all, the patient must be placed in the contralateral decubitus and FAIR position (Flexed Adducted Internally Rotated). Start with an ultrasound treatment: 2.0-2.5 W/cm2, for 10-14 minutes. Apply the ultrasound gel in broad strokes longitudinally along the piriformis muscle from the conjoint tendon to the lateral edge of the greater sciatic foramen. After that, begin with stretching of the piriformis which can be executed in a variety of ways. Stretch the piriformis muscle by applying manual pressure to the muscle’s inferior border. It is important not to press downward, rather directing pressure tangentially, toward the ipsilateral shoulder. When pressing downward, the sciatic nerve will compress against the tendinous edge of the gemellus superior. However, when applying tangential pressure, the muscle’s grip will weaken on the nerve and relieve the pain of the syndrome. (18, Fischman et al. (2002), level of evidence A2), Another way to stretch this muscle is in the FAIR position. The patient lies in a supine position with the hip flexed, adducted and internally rotated. Then the patient brings his foot of the involved side across and over the knee of the uninvolved leg. We can enhance the stretch, by letting the physical therapist perform a muscle–energy technique. This technique involves the patient abducting his limb against light resistance, which is provided by the therapist for 5-7 seconds, with 5-7 repetitions. After stretching, continue with myofascial release at the lumbosacral paraspinal muscles and McKenzie exercises. When the patient lies in the FAIR position, the lumbosacral corset can be used. PS is caused when the tight piriformis is forced to do the work of other large muscles (like the gluteus maximus, the gluteus medius), An alternative treatment approach for piriformis syndrome using a hip muscle strengthening program especially of the weak gluteal musculature with movement re-education can help in pain relief. Make frequent stops when driving to stand and stretch. Prevent trauma to the gluteal region and avoid further offending activities. Daily stretching is recommended to avoid the recurrence of the piriformis syndrome. Lie flat on the back and raise the hips with your hands and pedal with the legs like you are riding a bicycle. Knee bends, with as many as 6 repetitions every few hours. Piriformis syndrome (PS) is a painful musculoskeletal condition and is most often caused by macrotrauma to the buttocks, leading to inflammation of soft tissue, muscle spasms, or both, with resulting nerve compression. Patients with piriformis syndrome have many symptoms that typically consist of persistent and radiating low back pain, (chronic) buttock pain, numbness, paraesthesia, difficulty with walking and other functional activities. Piriformis syndrome continues to be a controversial diagnosis for sciatic pain. A complete neurological history and physical assessment of the patient is essential for an accurate diagnosis. Optimizing the therapeutic approach requires an interdisciplinary evaluation of treatment. ↑ 3.00 3.01 3.02 3.03 3.04 3.05 3.06 3.07 3.08 3.09 3.10 3.11 3.12 3.13 3.14 3.15 3.16 3.17 3.18 Lori A, Boyajian-O’ Neill, et al. Diagnosis and management of piriformis syndrome:an osteopathic approach. J Am Osteopath Assoc Nov 2008;108(11):657-664. ↑ 4.00 4.01 4.02 4.03 4.04 4.05 4.06 4.07 4.08 4.09 4.10 4.11 4.12 4.13 4.14 Tonley JC, Yun SM, et al. Treatment of an individual with piriformis syndrome focusing on hip muscle strengthening and movement reeducation: a case report. J Orthop Sports Phys Ther 2010;40(2):103-111. ↑ Siddiq MA. Piriformis Syndrome and Wallet Neuritis: Are They the Same?. Cureus. 2018 May;10(5). ↑ 8.0 8.1 Chapman C, Bakkum BW. Chiropractic management of a US Army veteran with low back pain and piriformis syndrome complicated by an anatomical anomaly of the piriformis muscle: a case study. Journal of chiropractic medicine. 2012 Mar 1;11(1):24-9. ↑ 9.0 9.1 9.2 9.3 Hopayian K, Song F, Riera R, Sambandan S. The clinical features of the piriformis syndrome: a systematic review. European Spine Journal. 2010 Dec 1;19(12):2095-109. ↑ 10.0 10.1 10.2 10.3 Smoll NR. Variations of the piriformis and sciatic nerve with clinical consequence: a review. Clinical Anatomy: The Official Journal of the American Association of Clinical Anatomists and the British Association of Clinical Anatomists. 2010 Jan;23(1):8-17. ↑ 11.00 11.01 11.02 11.03 11.04 11.05 11.06 11.07 11.08 11.09 11.10 11.11 11.12 11.13 Jankovic D, Peng P, van Zundert A. 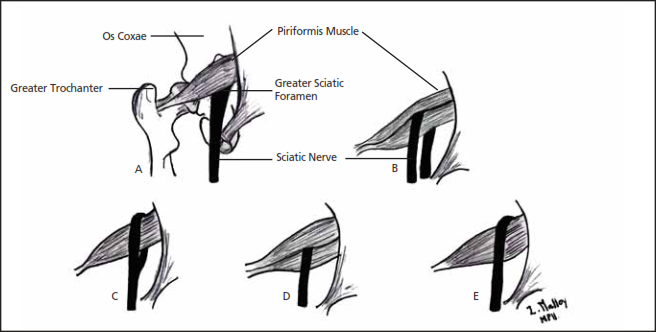 Brief review: piriformis syndrome: etiology, diagnosis, and management. Canadian Journal of Anesthesia/Journal canadien d'anesthésie. 2013 Oct 1;60(10):1003-12. ↑ 12.0 12.1 12.2 Hopayian K. The clinical features of the piriformis syndrome. Surgical and radiologic anatomy. 2012 Sep 1:1-. ↑ 15.0 15.1 15.2 15.3 15.4 15.5 15.6 15.7 Meknas K, Johansen O, Kartus J. Retro-trochanteric sciatica-like pain: current concept. Knee Surgery, Sports Traumatology, Arthroscopy. 2011 Nov 1;19(11):1971. ↑ Valdenassi L, Bellardi D. Treatment of piriformis syndrome with oxygen-ozone therapy. Ozone Therapy. 2017 Dec 31;2(3). ↑ 19.0 19.1 19.2 Fishman LM, Dombi GW, Michaelsen C, Ringel S, Rozbruch J, Rosner B, Weber C. Piriformis syndrome: diagnosis, treatment, and outcome—a 10-year study. Archives of physical medicine and rehabilitation. 2002 Mar 1;83(3):295-301.